One of Australia's leading pianists, Michael Kieran Harvey burst on to the world scene after winning the world's richest piano competition, the 1993 inaugural Ivo Pogorelich International Solo Piano Competition. This CD presents him playing some of the repertoire for which he is famous, including both of Carl Vine's monumental Piano Sonatas. The first of these was dedicated to Harvey and performed by him at the Ivo Pogorelich Competition in 1993. 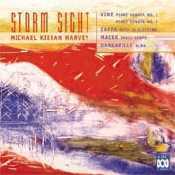 The second was commissioned by Harvey with Graeme and Margaret Lee and the Sydney Festival of the Arts (1998).